As you know, Hacienda Tranquila focuses on environment, social, and community issues by approaching them as one. This means that our work looks to problems affecting the surrounding community. One of our main focus areas is working with children in the community through a wide variety of initiatives and programs. Volunteers playing with children from a local preschool. One of our most successful initiatives with children of San Cristobal is through the hippo therapy program held every Tuesday and Thursday afternoons. Hippo therapy, or equine movement therapy, is a type of physical therapy that uses a house to address functional limitations, impairments, and disabilities in individuals with neuromusculoskeletal dysfunctions. The therapy helps individuals develop balance, body awareness, and muscle tone through the interaction with the horse's movement. Our therapy program works with disabled children through a variety of activities: leading the horses while the children are riding in various positions to stimulate development, teaching self-sufficiency skills, and interacting with children and their family members through games and play. All of the parents have stressed how significant of an impact this program has on the development of their children. One of our clients in the hippo therapy program. Hacienda Tranquila itself is located next to the La Soledad community school, and we have a history of positive engagement with the students and professors. Recently, four of the local students had the opportunity to visit the Galapagos Science Center located at the University of San Francisco Quito in town. With the assistance of the Hacienda, the students were given a tour of the facilities and equipment, and were able to use some of the tools for a brief activity. The students themselves were a bit shy, but with a little encouragement, talked with the guide and asked some good questions. Just having that exposure I'm sure will give the students the idea that they too can be scientists and use cool equipment! Some of the students at the Galapagos Science Center. In fact, a recent donation to the school included a brand-new microscope, tools for obtaining samples, and a hand-held microscope that the students can use outside. The Hacienda helped the school understand how to use the equipment, so I'm sure some neat experiments and unique learning will be taking place in the future. The professor and students at the community school. We have also helped around the school through painting buildings when needed, cleaning up trash and other debris around the grounds, and offering English tutoring for the students. The work we have done in and around the community has allowed the volunteers to establish a meaningful connection that will certainly impact the future success of the students. This week we will be discussing the coffee production process at Hacienda Tranquila and the steps volunteers go through from picking the beans to brewing the coffee. Anyone who has experienced a fresh cup of coffee at the Hacienda can certainly agree with the fact that the hard work brings a great reward. Your dirty fingernails from peeling the fruit and sore muscles from grinding the beans melt away with that first sip of 100% organic coffee. Volunteers always look forward to days that involve one of the steps in the coffee production because it means we have a fresh supply of coffee beans ready to go at a moment's notice! In the Hacienda’s coffee plantation, volunteers will harvest the coffee beans periodically when the trees are filled with coffee cherries. They are ready for picking when they appear bright red, glossy, and firm. Under-ripe cherries are hard and green, and over-ripe cherries have a dark and shriveled appearance. One of our volunteers picking the coffee cherries. Once the fruit is collected, volunteers will peel the thick outer layer of skin and remove the coffee beans. Under the fruit layer is the parchment, which is covered by a thin, slippery layer called mucilage. After removing the parchment, there are two translucent bluish-green coffee beans, which are coated within a thin layer called the silver skin. The outer layer is removed to get the coffee beans. In the drying process, ripe cherries are dried in the sun and generally take about two weeks to completely dry. Throughout the drying, cherries must be raked frequently while drying to avoid mildew. Spreading the beans out in the sun will allow them to completely dry. When the beans are fully dried, the last layer of dry skin and remaining fruit residue is removed through the grinding of a simple millstone in a process called hulling. Volunteers grind the beans to remove the dried skin. This step in the process produces the characteristic flavor of coffee by forcing the green coffee beans to expand and change in color, taste, and smell. Roasting at the Hacienda is done in a pan over a fire, and the beans will darken the longer they heat. Roasting the beans over the fire. Prior to brewing, volunteers will grind the roasted coffee beans using the simple millstone. The process is then complete, and fresh ground coffee is ready to be enjoyed! Delicious, organic coffee ready for brewing. Unlike traditional coffee production, our process involves zero carbon dioxide emissions because everything is done by hand including the transport of coffee cherries and the grinding of the beans. We rely solely on the hard work of our dedicated volunteers to produce the coffee. In the future, we plan on expanding the size of our coffee plantation to create a larger supply for use within the local community. We can't wait to share a fresh cup of Hacienda Tranquila's 100% organic coffee with you! Hello to all of our friends across the globe and welcome to Hacienda Tranquila’s new and improved blog! We’ll be keeping everyone updated on the exciting events happening around the Hacienda and hopefully make some new friends along the way. Every few weeks or so, you can expect an update regarding our various projects and interesting stories from our staff and volunteers. To get things started, we'll take a look at what our project is all about. We’re a small organization located on San Cristobal Island, Galápagos, focused on strengthening both the environment and community. Since our beginnings in 2007, local works and international volunteers have achieved countless conservation projects to improve sustainable development in the island's fragile environment. We accomplish our outreach and environmental activities on the island by restoring endemic forests and protecting farmers from invasive species, and providing the community with improved access to water, therapy, and education. Volunteers work on both environmental and social projects. How it all works is that volunteers come from around the world for one to twelve weeks to live, work, and grow in a 50 hectare area dedicated to preserving the ecological and social systems of the Galápagos. The work can vary: volunteers one day could be battling Mora (invasive blackberry) with a machete, and that same afternoon do English tutoring with children from the local school. Volunteers have planted more than 3,000 trees in five different areas of the island to protect endangered species. Additionally, we developed a nursery with plants to be transplanted and distributed to schools and farmers in the community. Volunteers working in the Scalesia area of the Hacienda. Hacienda Tranquila is currently assisting 20 families across the island to recover their abandoned farms. Staff and volunteers help cultivate their farms so they can supply the community with organic products and increase local production. Local production prevents excessive importation of fresh fruit and vegetables and reduce the introduction of invasive species that endanger the endemic ecosystems. Some days are spent working with farmers throughout the island. Our staff and volunteers worked for over one year to bury fifteen kilometers of pipe along rough terrains to supply water for the community. Our work provided access to a suitable water source for 200 people. Volunteers burying the water pipe. 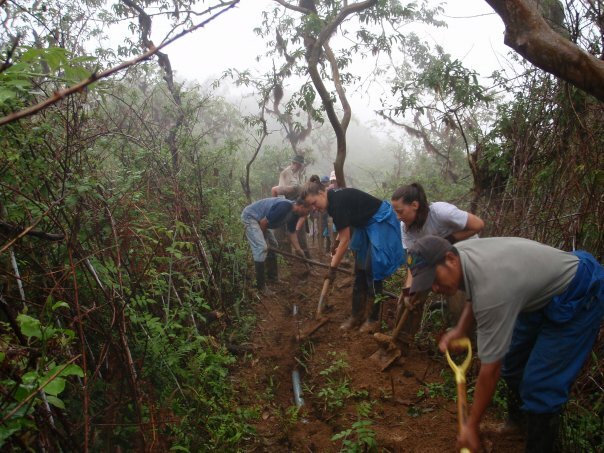 The project has planted 750 trees, specifically two types of species which capture carbon dioxide from the atmosphere: Manzanillo and Matarzarno. Of this quantity, 250 are Manzanillo, each tree capturing 470 kilograms per year, and 500 are Martazarno, each tree capturing 148 kilograms per year helping to capture 191 tons of CO2 from the atmosphere each year. Matazarno, one of the most important carbon sequestration species. We have created a program of hippo-therapy that uses activities on a horse which has a significant positive impact on children in San Cristobal. Over the last four years, 180 disadvantaged and disabled children have been served from numerous organizations, including a local preschool and summer camps, with sometimes as many as 80 children at once. We have also helped furnish the school in the community and materials for English language learning. The hippo-therapy program is very rewarding for both the children and volunteers. The staff and volunteers of Hacienda Tranquila represent over eighteen countries worldwide and in the past year alone, have recovered the Manual G. Covos historical site (the first hacienda of El Progreso), spent nine months constructing a home for a local family, cleared close to 6000 square meters in Sendero al Mirador and planted over 250 endemic species, and expanded our organic agriculture initiatives. These are just a few of the amazing accomplishments our staff and volunteers have achieved! Hopefully that gave you an informative look at Hacienda Tranquila and the transformation we have initiated over the past four years of operation. Check back soon for our next story!